More than the quantity of Black Money, it is an understanding of the quality, or the blackness of money, which may help us to finally surmount our social-economic problems. 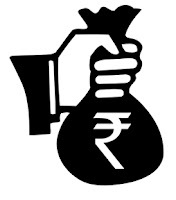 Black Money refers to undeclared income, on which no taxes have been paid. By using the phrase ‘blackness of money’, I refer to the source, legitimacy and relevance of that income. Black Money can be unearthed, while Blackness of Money has to be understood. Unearthing Black Money is a mechanical exercise, and it can modify the accounting system; while understanding Blackness of Money is an exercise in comprehension, and it can help us move towards a lasting solution. 1) The fairest of money is the money earned and saved through a harmonious social-ecologic-economic activity where labour and skill are self-employed to produce something useful for community. 2) Less fair than that is money that is earned through useful economic activity but with ecological irresponsibility. 3) Least fair money is that which is earned through legal economic activity but with gross social irresponsibility. 4) The really black money is that which is not earned, or only partially earned. 5) And the blackest of money is that which comes from cheating, stealing, extortion, bribery and misuse of position. Who comes in Category 1? All our farmers (those who work on their land, not the absentee owners of agricultural land). All our self-employed artisans – blacksmiths, goldsmiths, tailors, barbers, cobblers, carpenters, potters, weavers, electricians, plumbers, mechanics, etc.. All those in cattle rearing and dairies, and skilled workers in brick kilns, oil mills, etc. A majority of the small-scale industry sector who do food processing, metal fabrication, furniture works, or run handlooms, automobile workshops, etc. And also all the traditional food outlets and shopowners. Therefore, about 70 per cent of the population falls under the first category. The second category is what a large part of the organised economy presently is. There is use and great abuse of modern technology, as seen in mining, in refineries, in cement and electricity production, and much else. Earlier, only large-scale industries were ecologically irresponsible, but with down-sizing of tools and techniques, the Power Saw and the JCB machine have reached almost every village, causing widespread damage to the environment. A rapidly increasing dependence on diesel-based transportation adds to the problem. Yes, we need many of these activities and goods, but the way, and the scale, in which they operate puts them in Category Two, the danger being that the faster they grow, the faster the ecological destruction. Some 12 to 15 per cent of the population is directly and indirectly related to the second category. What comes in Category Three? You may note that it is legal to manufacture and market liquor and cigarettes; it is legal to manufacture toxic chemicals, pesticides, and polythene products; it is legal to entice people to buy and use such products, which is what the advertising business does; it is legal to run so-called ‘call centres’ where our youth are trapped in nocturnal slavery; and it is (somewhat) legal in Goa to run gambling dens called casinos. For its gross social irresponsibility, I put the money earned through these and similar means in the third category. Less than 5 per cent of the population would be directly and indirectly linked to these activities but the social damage done by them is enormous. Who belongs to Category 4? Doing no work but simply collecting rent income is economic farce. The entire financial sector is steeped in this dubious activity, using money to ‘make’ more money, led by the stock and commodities markets, forward trading, mutual funds and the like. This activity is supported fully by politicians of all hues because they are overwhelmed by finance-driven White Economics (read earlier post Black Money, White Economics). This is completely uneconomic, unearned money, but Indian laws have not yet made the distinction between earned and unearned income. The second, and huge, part of Category 4 is the real estate business, which shows frightfully high inflation for the same square foot. So there is no real value addition, but enormous cash expansion, which is simply unearned income. The real estate blackness is so ubiquitous that almost every village and municipality has its agent-millionaires in their SUVs; usually, many of them also in politics, fighting the Gram Panchayat and Nagar Palika elections – is that any surprise? I would also include in this category the professionals who are vastly overpaid; they have only partially earned their money. Software writers, for example; it is ridiculous that people should get five lakh rupees a month for writing words on a screen. The upper echelons of bureaucracy too are vastly overpaid for their uneconomic contribution. Less than one per cent of the population is directly linked to the financial sector, but a considerable percentage of the rich and upper middle class get unearned rentier income or unearned salaries through these activities. This is a pivotal cause of gross inequality which is not just an economic but a deeply social problem. And, finally what about Category 5? We are of course aware of the ‘robbers and cheats’ among crooked bureaucrats and businessmen, the bribe-takers, the bribe-givers, the commission agents, the corrupt lobbyists, those with illegal foreign accounts and links with black money havens like Switzerland, Panama, Cayman Islands, Luxembourg, Mauritius and Singapore. The problem here is not evasion of tax, but a criminal activity leading to illegal income – and this behaviour, when unchecked like it has been for 50 years in India, is also contaminating; it infects more and more people with its virus. Government employees account for less than 4 per cent of the population, but the low-level continuous corruption, from municipal corporation to state government to central government, is sapping the true economic spirit of the nation. But yet, the real culprits are in a different bracket, those who misuse their social and political positions. A mere 50 bureaucrats, some 20 industrialists and a dozen politicians – just a handful of powerful people – can make and influence such changes in laws so as to ruin the lives of millions, so as to endanger the environment, so as to make windfall profits for some, and cause harm to the nation. For example: say a PM, let’s take a random name, say Mannu, initiates a law allowing partial convertibility and a whole lot of corporate black money gets out of the country. Or say an FM, let’s take a random name again, say Chiddu, allows a dubious investment treaty with Mauritius and allows the same corrupt corporate black money to come back into India, now legally. Or say, an Agriculture Minister, randomly named Sharad, initiates the entry of genetically tampered seeds and ruins the lives of lakhs of farmers. Or let’s take a son-in-law, with a random name of Robert, who buys agricultural land at 1 rupee, and then a CM, with a random name of Hooda, simply changes the land usage rules, and suddenly in an instant, that land is worth 1000 rupees, ‘legally’. Or let’s take two consecutive FMs, say Chiddu and Arun, both of whom reduce corporate tax to ridiculously low levels, lower than many wealthier and capitalist European nations, further enriching our shady industrialists. These examples show how a select powerful few can make unwise things happen, make illegal things legal, turn corrupt money into clean money, and make cheats and robbers into so-called successful celebrities (shall we recall a chap named Mallya?). So the ‘bribe’ money or favour which the politician and bureaucrat accepts is a small, miniscule thing, but the effect of the change in law or policy which that person effects is huge, resulting in thousands and thousands of crores of rupees of unfair gains to a certain segment, and unfair losses to another segment. And the blackness of such deeds cannot be counted or accounted for or corrected through ‘Black Money’ raids, because it doesn’t exist in that form. For a lasting social-economic solution, Category 1 needs to be strengthened, Categories 2 and 3 need reform, while Categories 4 and 5 need to disappear because they are the most serious issues before us. And all this is related not just to economics, but to politics & governance, and education & ethics. It is in this larger context that I see the present action of demonetization of the higher currency notes. Counting the present black money, if at all that is possible, is only one small thing; addressing the blackness of money which has seeped into our economic behaviour and to have the vision and courage to correct that, well, that is quite another thing altogether. That is what we have to wait and see: Is Narendra Modi going to go the full distance, or is this just a sensational event from the event manager?